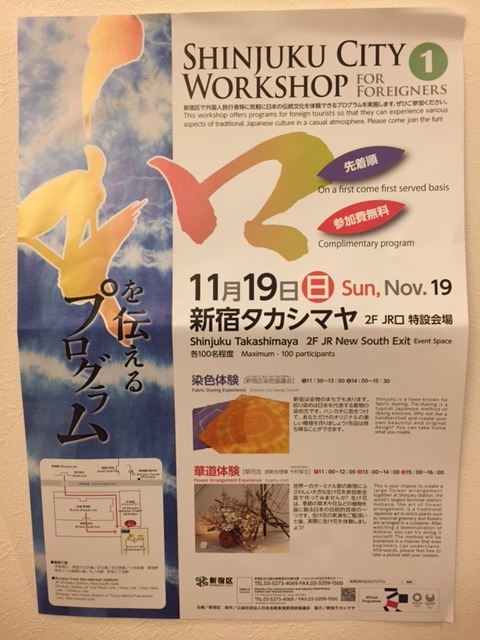 This workshop offers programs for foreign tourists so that they can experience various aspects of traditional Japanese culture in a casual atmosphere. Please come join the fun! *Please come to the reception area before you participate in the program. Shinjuku is a town known for fabric dyeing. Tie-dyeing is a typical Japanese method of dyeing kimonos. Why not dye a handkerchief and create your own beautiful and original design? You can take home what you create. This is your chance to create a large flower arrangement together at Shinjuku Station, the world’s largest terminal station. Ikebana, the art of flower arrangement, is a traditional Japanese art in which plants such as seasonal greenery and flowers are arranged in a container. After watching a demonstration of ikebana, you can try doing it yourself! The method will be explained in a manner that even beginners can understand. Afterwards, please feel free to take a picture with your creation. *There’s a possibility these programs will change.Thank you for your understanding.